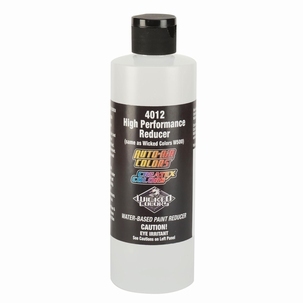 Wicked W500 / Auto Air 4012 High Performance Reducer is an additive intended for use with Wicked Colors and Auto Air Colors. High Performance Reducer greatly improves flow and reduces tip-dry compared to reducing with Wicked W100 or Auto Air 4011 Flash Reducer. High Performance Reducer enhances flow without surface tension allowing for greater coverage per coat without risk of craters which may occur when reducing with W100 or 4011 Reducers. Colors also dry faster and cure with improved film properties through air drying alone compared to reducing with W100 or 4011 Reducers. When reduced with High Performance Reducer, colors appear matte and level after curing. High Performance Reducer also works well with new Createx Illustration Colors.